Holland Class Submarine: Laid down in November 1896 at Crescent Shipyards, Elizabeth, NJ; Launched in March 1897; Purchased by the Navy, 18 April 1900; Commissioned, USS Holland, 12 October 1900; Decommissioned and simultaneously struck from the Naval Register, 21 November 1910, at Norfolk, VA; Final Disposition, sold, 18 June, 1913, to Henry A. Hitner & Sons, Philadelphia, PA. Specifications: Displacement; Surfaced 64 t., Submerged 74 t.; Length 63' 10"; Beam 10' 3"; Draft 8' 6"; Speed, Surfaced 8 kts, Submerged 5 kts; Depth Limit 100'; Complement, 1 Officer, 6 Enlisted; Armament, one 18" torpedo tube, three torpedoes, one bow mounted 8" pneumatic dynamite gun; Propulsion, Otto Gas Engine Works, gasoline engine, HP 45, Fuel Capacity, 1050 gals; Electro Dynamic electric engine, HP 55; Battery Cells, 60, single screw. 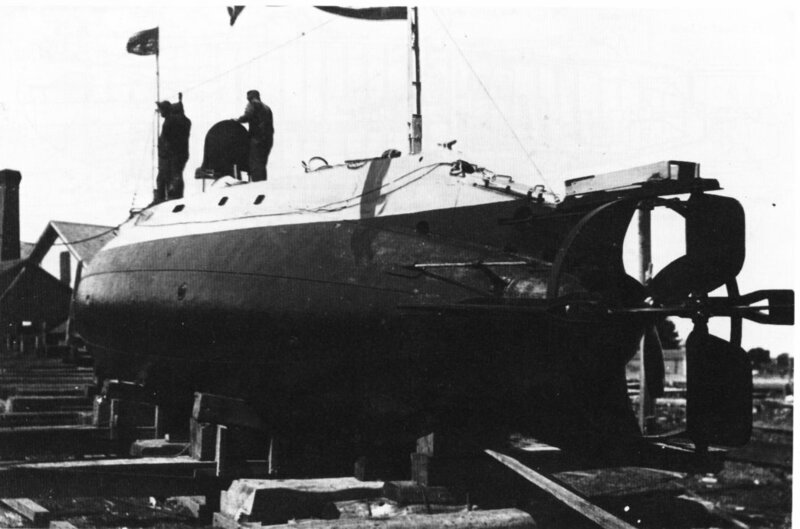 141k Holland (SS-01) being prepared for launching, at the Crescent Shipyard, Elizabethport, New Jersey, circa 17 March 1897. Note that her steering and diving planes are located forward of the propeller. U.S. Naval Historical Center Photograph # NH 53458 via Robert Hurst. 120k Holland (SS-01) Christening ceremony, at the Crescent Shipyard, Elizabethport, New Jersey, 17 March 1897. Her Sponsor, Mrs. Lawrence, is visible just beyond Holland's bow. U.S. Naval Historical Center Photograph # NH 53459 via Robert Hurst. 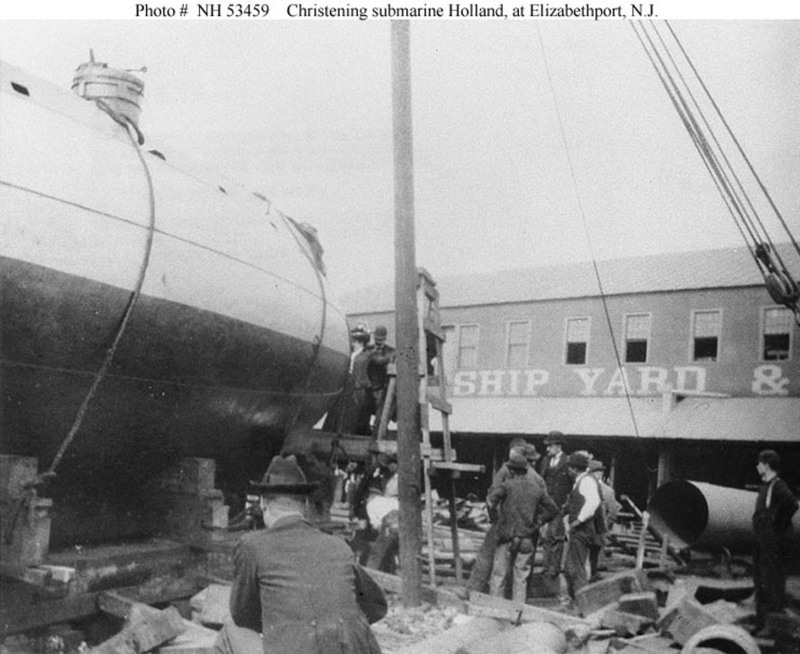 30k The Holland (SS-01) slides down the building ways March 1897 at Crescent Shipyards, Elizabeth, NJ. Photo from War Under The Pacific, by K.Wheeler and submitted courtesy of Robert Hurst. HOW THE SUBMARINE TORPEDO-BOAT HOLLAND (SS-01) LEFT THE WAYS. The launch of the submarine ship-destroyer Holland at Elizabethport. N. J., last week was in some respects unlike any launch that ever took place. The vessel slid into the water on two greased ways, as is the custom. This craft is ovoid in form, with the exception of a small flat superstructure and it was necessary to send it into the water in a cradle reaching well up the sides and holding the boat rigid, so that it should not roll over on the journey down the ways. This cradle was fastened to the sliding ways. The ends of the narrow cross-beams of the cradle were held fast by stout ropes which were tied to supports on the top of the boat. There was no anchor to be dropped as the boat reached the water but a long towline was stretched from the stern to a tug so that the boat should not get beyond control in the water. The Holland has a heavy blunt bow, and tapers in the decreasing circles of the frames to a very sharp stern. She weighed about fifty tons when ready for launching, and it was necessary to guard against complete submergence under the momentum gathered on the ways. Boats with the ordinary lines are usually lifted at the stern by the water when they are launched. One with a stern sharpened almost to a point, as the Holland was, it was feared might go to the bottom. Five tons of water were put in her bow, therefore, so as to raise her stern perceptibly. Then there had to be a special preparation of the ways. Those on which the Holland rested ended about ten feet in the water, where at high tide there was a depth of only about four feet. Mr.Nixon pieced out the stationary ways to deep water by floating ways, which were strapped to the stationary ones. 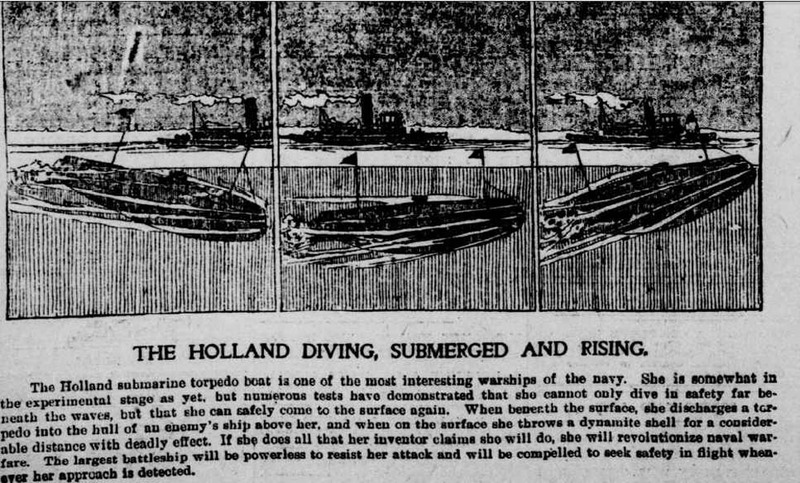 The idea was that when the Holland reached the floating ways she would press them into the mud, giving the boat a nearly level position before she slid into deep water. On the first move of the boat the crowd in the yard gave a mighty cheer. When the boat reached the water the cheer died away. The Holland assumed nearly a horizontal position while passing over the floating ways. Then she began to dip at the stern and gradually sink into the water. The bow rose slightly, and finally the vessel became clear. Down into the water purged the heavily laden bow with a stiff courtesy. The bow was not submerged and arose quickly. The vessel continued to slide backward into the water and to sink by the stern. There was almost absolute stillness as the spectators watched to see if she was going under. The bow began to sink again slightly, and before the vessel had gone twenty feet the stern began to rise and in a second or two the Holland was floating on the water just as it was predicted she would float. A noise akin to what pandemonium is supposed to be started in the shipyard, and Mr. Holland was overwhelmed with congratulations. One of the local experts employed in the shipyard had written in chalk on the vessel a few days before she was launched: "When this vessel is launched she will sink and never come up." The Holland's performance showed how much this local expert knows. She floated two inches above her estimated water line. Image and text provided by University of California, Riverside. Photo & text by The San Francisco Call. (San Francisco [Calif.] 1895-1913, 24 May 1897, Image 4, courtesy of chroniclingamerica.loc.gov. 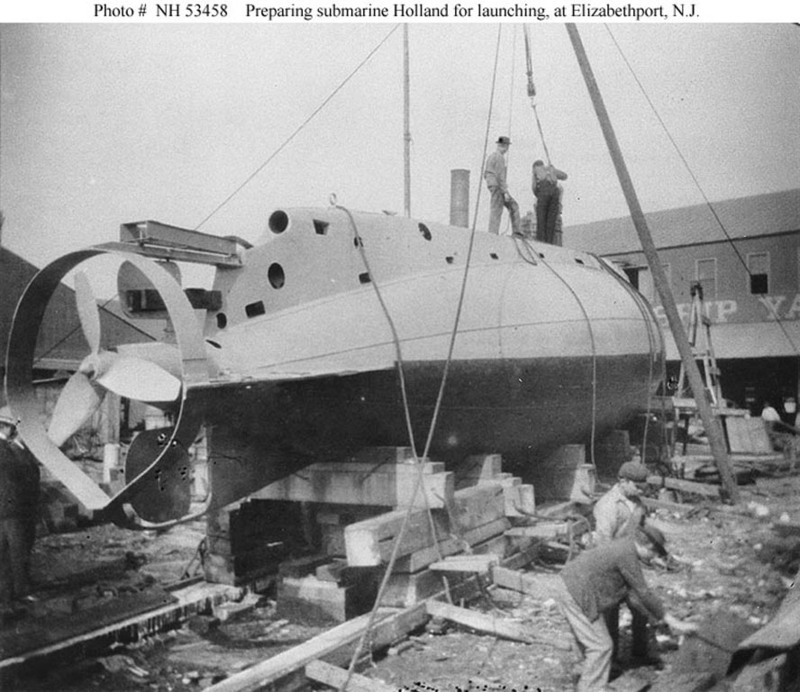 In the presence of a few persons the Holland submarine torpedo boat was launched at the Crescent shipyards, Elizabeth, N. J., the other day. The vessel was christened "The Holland " by Mrs. Nixon, wife of Lieutenant Lewis Nixon, the constructor. Inventor Holland says there will not be any attempt at submarine evolutions for several weeks. The boat is cylindrical in shape, fifty feet three inches long, with a four foot screw-protecting extension. The diameter is ten feet three inches amidships and the molded diameter is the same. The boat can travel under water eight knots an hour for eight hours and ten knots on the surface. The power comes from a gasoline engine and a dynamo, the former to be used when the boat is sailing along the surface and the latter when she is submerged. It will take less than a minute to submerge the boat and about the same length of time for her to rise to the surface. Six men will constitute the crew. The armament consists of three torpedo tubes, one at the upper bow of the boat being an aerial torpedo thrower, with a range of one mile. Six projectiles weighing 180 pounds each, with charges of 100 pounds of explosives, are to be stored for this gun. Almost directly beneath the torpedo thrower is an explosive tube for Whitehead torpedoes. Only three of these torpedoes will be carried, as each one weighs 850 pounds. At the stern of the boat is a submarine gun, which, with a 100-pound charge of explosive, can hurl a 400-pound projectile 100 yards or more through the water. Five of these projectiles will be carried. Mr. Holland was asked by the United States, British and Spanish governments to allow a representative on board during the trial trip of the boat, but he refused the request. After a trial trip he says he will allow an engineer from each government to see the workings of the boat, which it is believed will revolutionize warfare. Several foreign nations have bid for the vessel, but it is likely that Mr. Holland will sell it to the United States. Image and text provided by Minnesota Historical Society; Saint Paul, MN. Photo & text by The Princeton Union. (Princeton, Minn.) 1876-1976, 10 June 1897, Image 6, via The New York Journal, courtesy of chroniclingamerica.loc.gov. 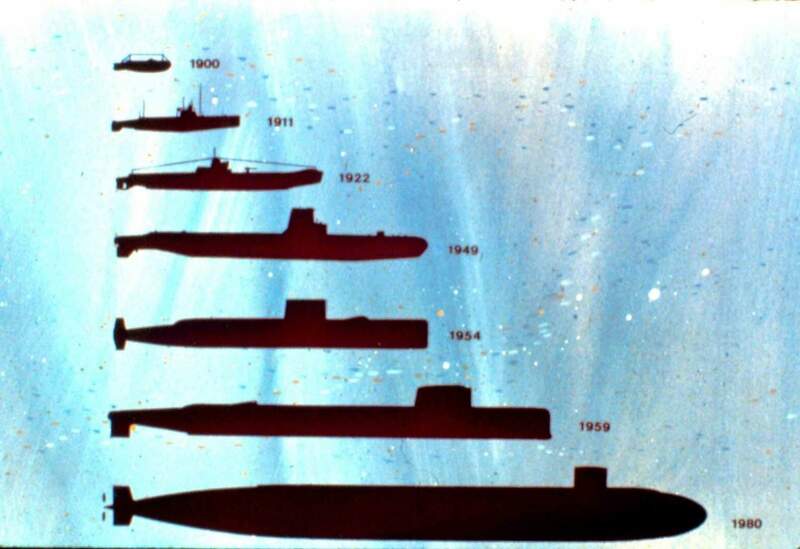 Every Naval Power Possesses or Is Building a Submarine Navy. The submarine torpedo boats owned by the United States, England, France, Russia and Japan. Naval authorities declare the battles of the future will all be fought beneath the waves. Image and text provided by Minnesota Historical Society; Saint Paul, MN. Photo & text by The Saint Paul Globe. (St. Paul, Minn.) 1896-1905, 12 September 1897, Image 26, via courtesy of chroniclingamerica.loc.gov. 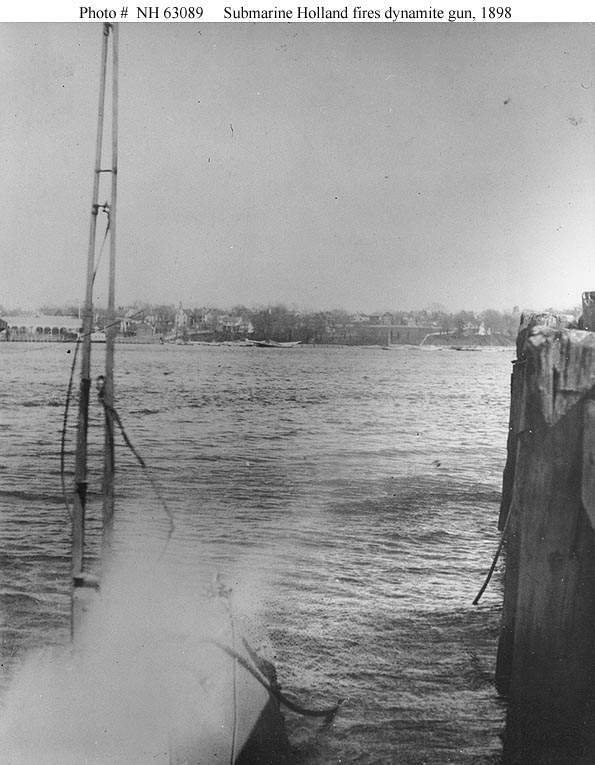 59k The Holland (SS-01) firing her bow Zalinsky dynamite gun while docked at Perth Amboy, New Jersey, in the spring of 1898. The projectile is visible in flight, in the photograph's upper right. USN photo # NH 63089 courtesy of the US Naval Historical Center. Courtesy of Dr. R.K. Morris. 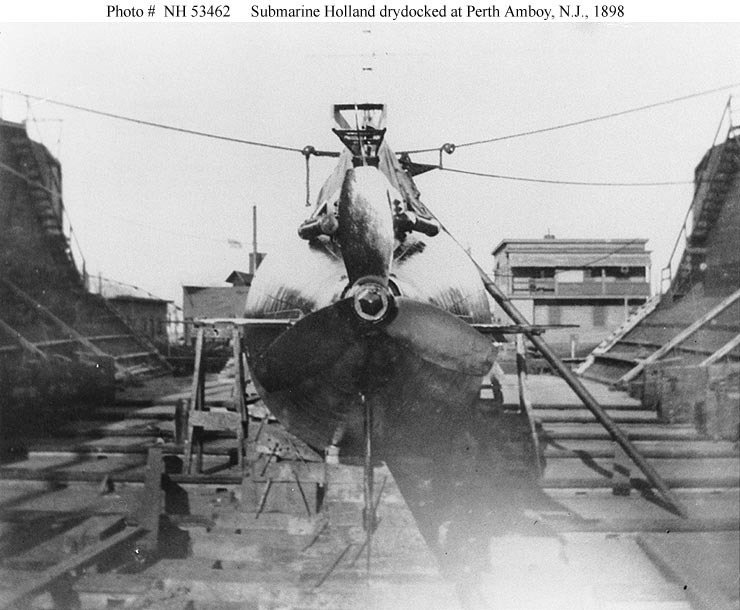 79k Holland (SS-01), stern view showing her propeller, taken in the Raritan Dry Dock, Perth Amboy, New Jersey, 1898. USNHC photo # 53462. 842k FIFTY HOLLAND (SS-01) SUBMARINE TORPEDO-BOATS MAY GUARD OUR COAST. This is an accurate picture of the Holland (SS-01) submarine boat. The Government has been considering the building of fifty of these submarine terrors to scatter along our coasts. It has been demonstrated that one of these boats could easily take care of three battleships of the Vizcaya style. Upon sighting the enemy the boats at the different stations along the coast would be sent out and could annihilate the enemy before any damage could be done or a landing secured. A successful trial of the boat was made Thursday. Image and text provided by Library of Virginia; Richmond, VA.
Photo & text by The Times. 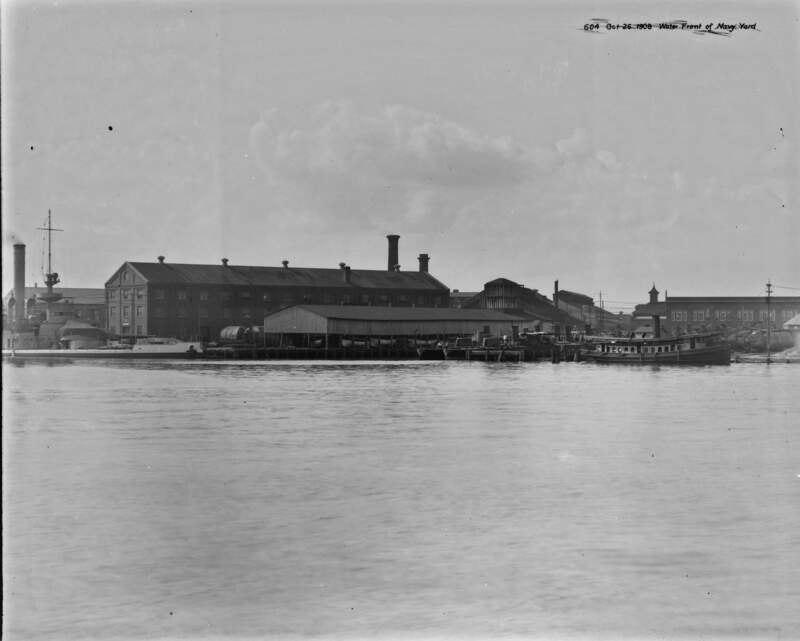 (Richmond, Va.) 1890-1903, 20 March 1898, Image 1, courtesy of chroniclingamerica.loc.gov. 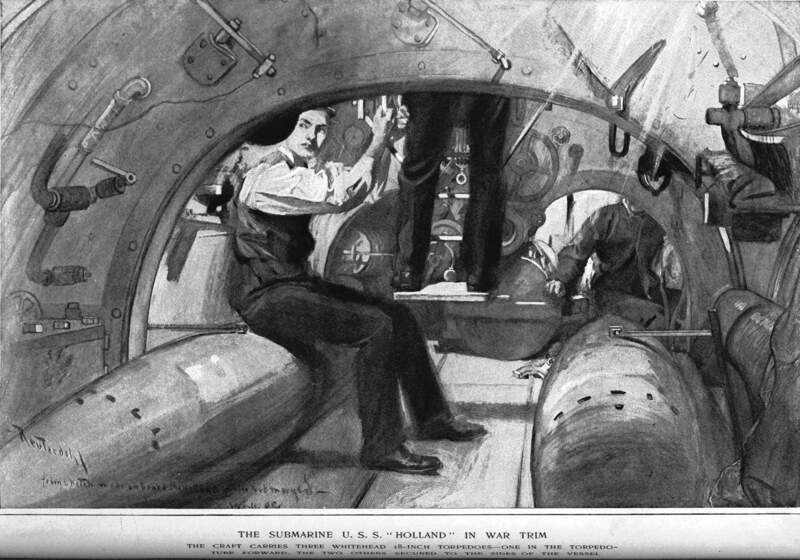 INTERIOR VIEW OF THE TERRIBLE HOLLAND (SS-01) SUBMARINE TORPEDO BOAT Image and text provided by University of Utah, Marriott Library. Photo & text by The Salt Lake Herald. (Salt Lake City [Utah) 1870-1909, 27 March 1898, Image 2, courtesy of chroniclingamerica.loc.gov. The most marvelous boat in the world and the work it can do. Image and text provided by University of Kentucky, Lexington, KY.
Photo & text by Houston Daily Post, 03 April 1898, Image 3, courtesy of chroniclingamerica.loc.gov. 1.10k THE LATEST NAVAL WONDERS FOR DESTROYING BATTLESHIPS. Image and text provided by University of California, Riverside. Photo & text by The San Francisco Call. (San Francisco [Calif.] 1895-1913, 24 April 1898, courtesy of chroniclingamerica.loc.gov. 1.05k HOLLAND (SS-01) SUBMARINE BOAT IN HAVANA WATERS. Image and text provided by West Virginia University. Photo & text by The Wheeling Daily Intelligencer. (Wheeling, W. Va.) 1865-1903, 10 May 1898, Image 6, courtesy of chroniclingamerica.loc.gov. 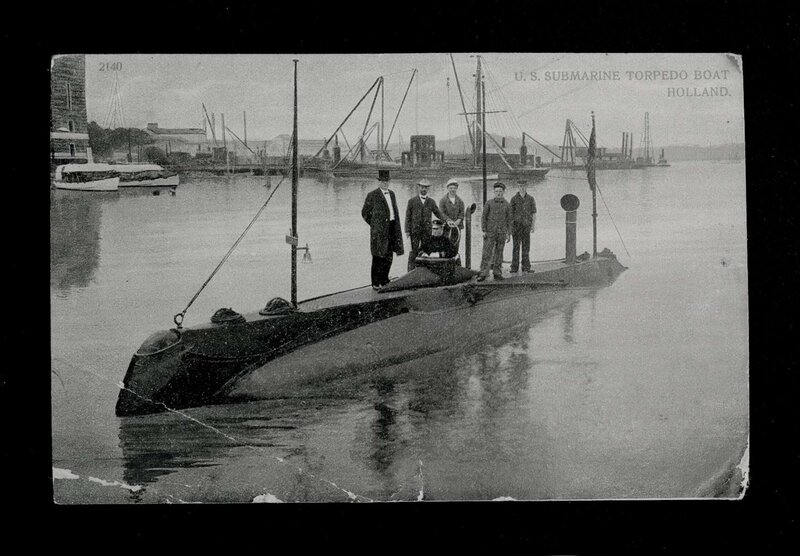 886k AMERICA'S NEW ARMORED TORPEDO BOAT HOLLAND (SS-01) Image and text provided by University of California, Riverside. Photo & text by The Herald. (Los Angeles [Calif.] 1893-1900, 24 May 1898, Image 2, courtesy of chroniclingamerica.loc.gov. 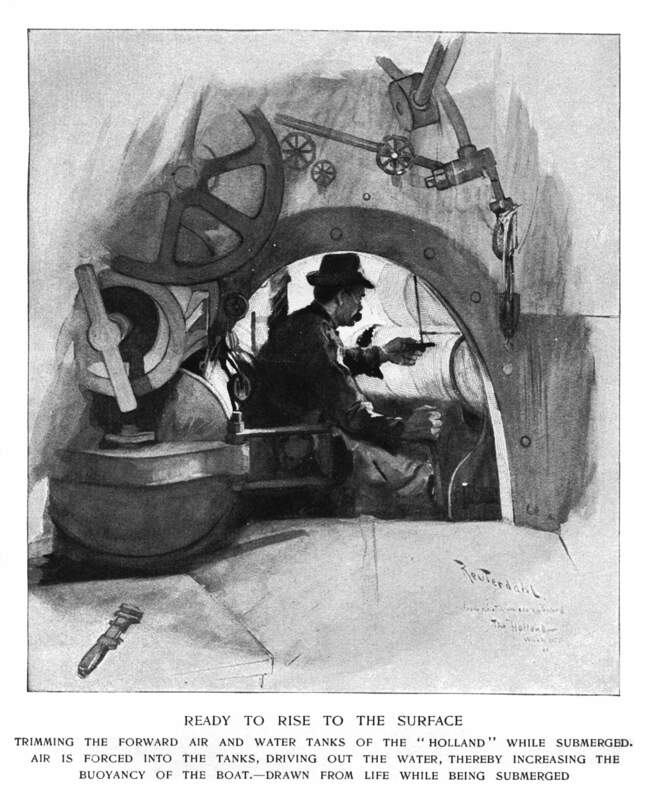 Scheme Is to First Countermine the Harbor and Then Go in and Try to Destroy One or More of the Spanish Ships Working Under Water Image and text provided by University of North Texas; Denton, TX. Photo & text by The Houston Daily Post. (Houston, Tex.) 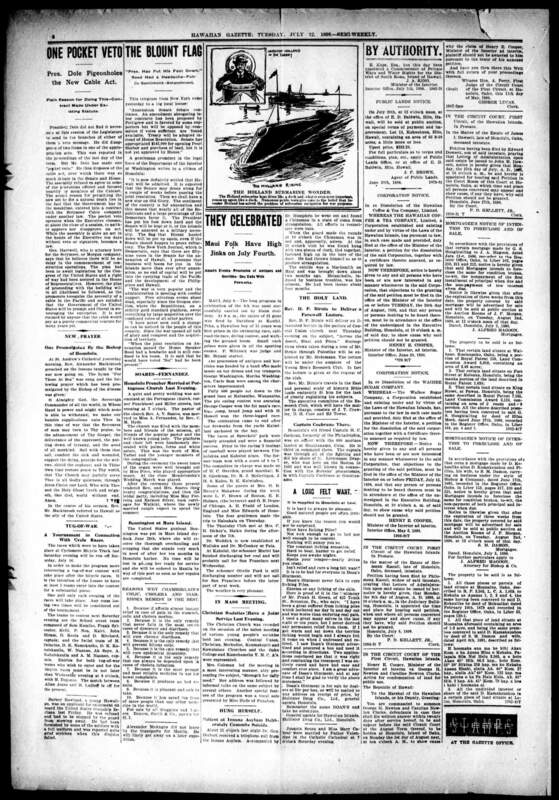 1886-1903, 27 May 1898, Mailable Edition, Image 5, courtesy of chroniclingamerica.loc.gov. 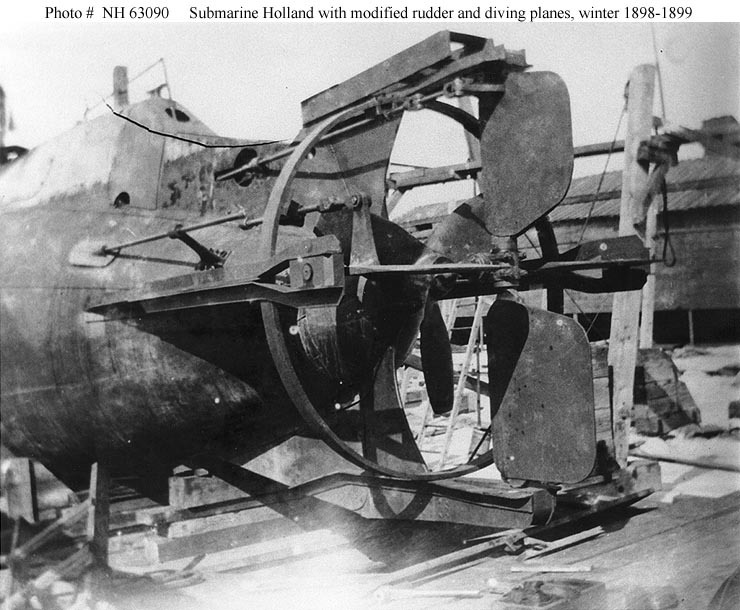 237k THE HOLLAND (SS-01) DIVING, SUBMERGED AND RISING. The Holland submarine torpedo boat is one of the most interesting warships of the navy. She is somewhat in the experimental stage as yet, but numerous tests have demonstrated that she cannot only dive in safety far beneath the waves but that she can safely come to the surface again. When beneath the surface, she discharges a torpedo into the hull of an enemy's ship above her, and when on the surface she throws a dynamite shell for a considerable distance with deadly effect. If she does all that her inventor claims she will do, she will revolutionize naval warfare. The largest battleship will be powerless to resist her attack and will be compelled to seek safety in flight whenever her approach is detected. Image and text provided by University of California, Riverside. Photo & text by The Record-Union. (Sacramento, Calif.) 1891-1903, 03 June 1898, Image 6,courtesy of chroniclingamerica.loc.gov. 2.83k HOLLAND (SS-01) SUBMARINE BOAT, AN UNKNOWN QUANTITY IN THE WAR Image and text provided by Minnesota Historical Society; Saint Paul, MN. Photo & text by The Appeal. (Saint Paul, Minn. ;) 1889-19? ?, 18 June 1898, Image 2, courtesy of chroniclingamerica.loc.gov. The Holland submarine boat dives like a duck and, even more important, comes up again like a duck. 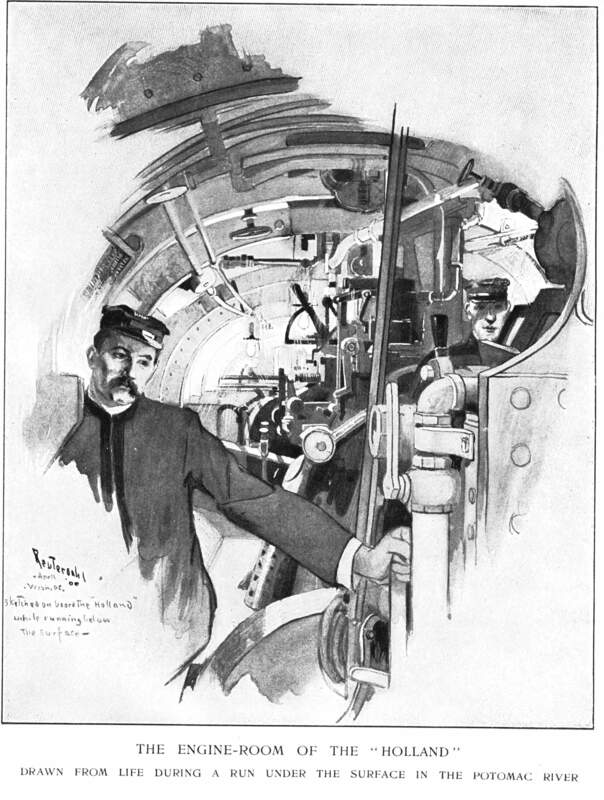 Numerous public tests give color to the belief that inventor Holland has solved the problem of submarine navigation for war purposes. Image and text provided by University of Hawaii at Manoa; Honolulu, HI. Photo & text by The Hawaiian Gazette. (Honolulu [Oahu, Hawaii] 1865-1918, 12 July 1898, Image 6, courtesy of chroniclingamerica.loc.gov. 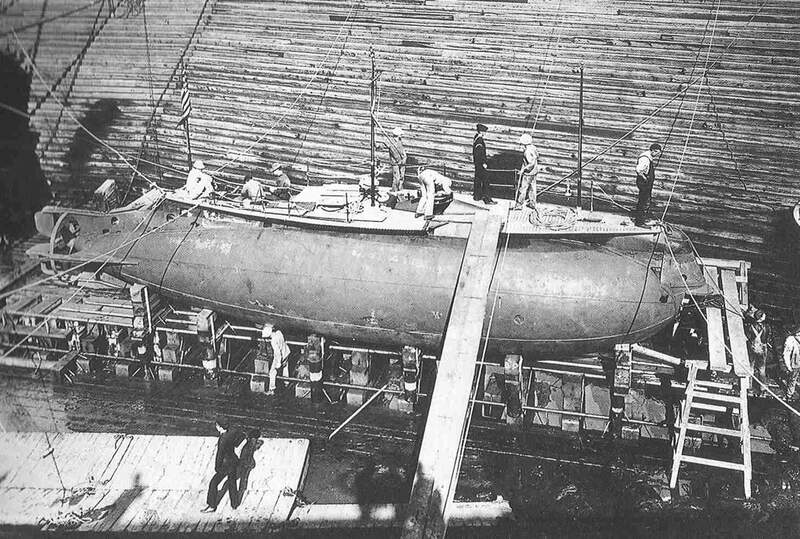 101k Holland (SS-01), being placed in the water at Greenpoint, Long Island, New York, while undergoing trials in 1899. Note the two-masted schooners in the background. USNHC photo # 53440. 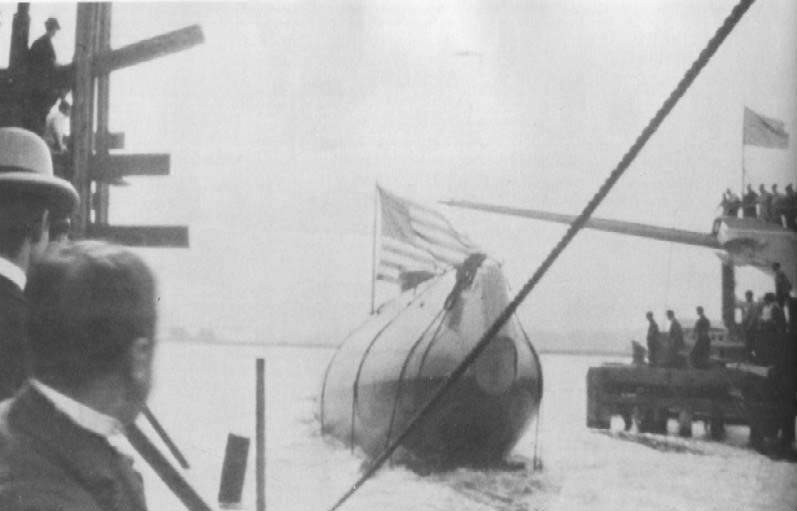 The Holland (SS-01) is here shown on her trial spin. Image and text provided by University of Nebraska-Lincoln Libraries, Lincoln, NE. Photo & text by The North Platte Semi-Weekly Tribune. (North Platte, Neb.) 1895-1922, 10 August 1920, Image 6, courtesy of chroniclingamerica.loc.gov. 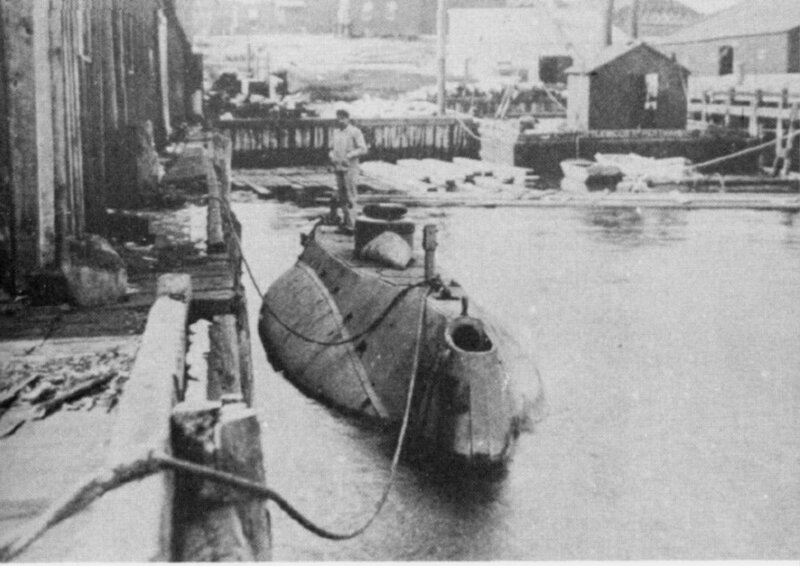 101k Holland (SS-01) hauled out of the water at Morris Heights, Harlem River, New York, during the winter of 1898-1899. 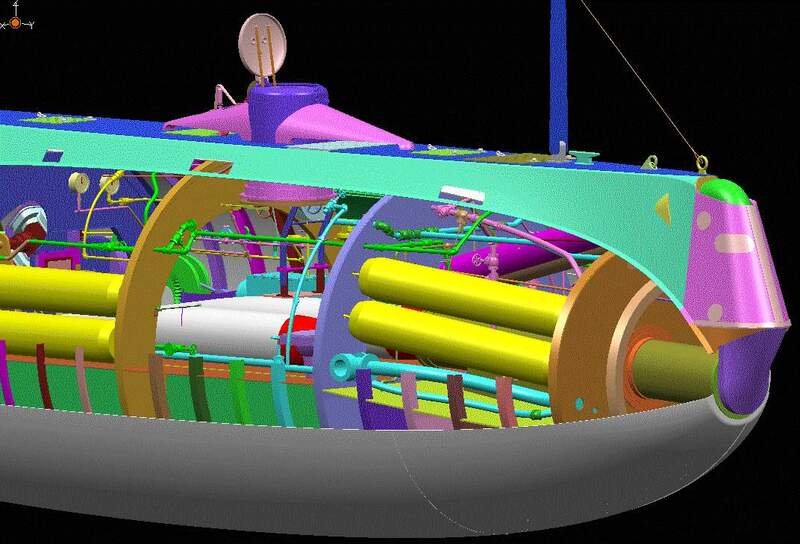 Her stern has been extensively modified to relocate her steering mechanism and diving planes aft of her propeller. USNHC photo # 63090. 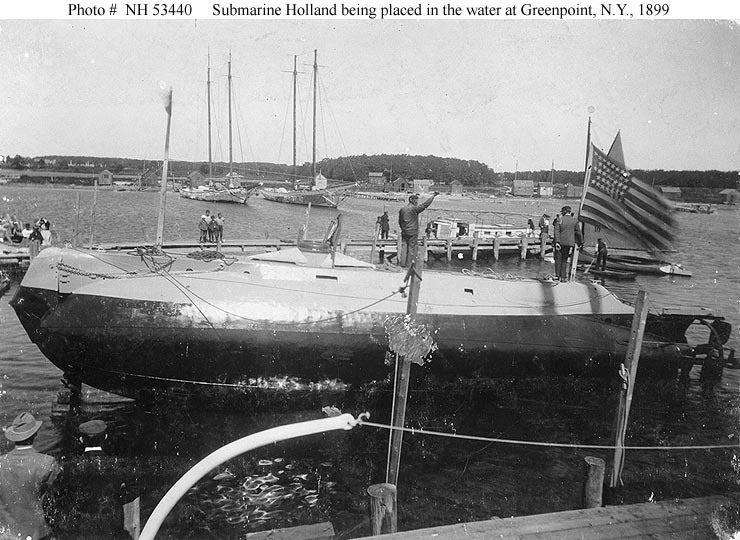 97k Modified in her final form, Holland (SS-01), is shown at Greenpoint, Long Island, in 1899. Rudders have been moved abaft the propeller. The box above is probably Holland's auto-steering device. The after pneumatic gun has been removed. Forward, the bow cap has been raised (hauled up) to reveal the blanked - off muzzle of the single torpedo tube. The two masts folded down when the boat submerged. Photo & text courtesy of U.S. Submarines Through 1945, An Illustrated Design History by Norman Friedman. Naval Institute Press. 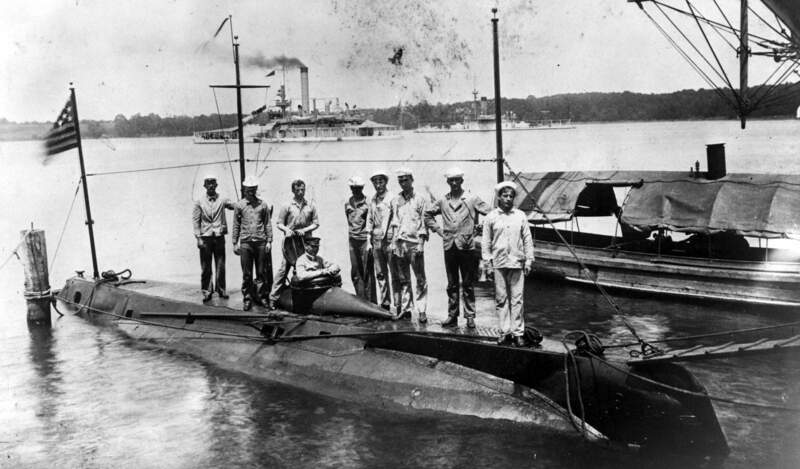 First U.S. Diesel submarine: E-1 (SS-24) in 1911. First Fleet boat: V-1 (SS-163) in 1922. THE Holland, Uncle Sam's "steelclad helldiver," is, strictly speaking, a torpedo, but a torpedo controlled in all its workings by human agency inside the craft.... Image and text provided by University of California, Riverside. Photo & text by The San Francisco Call. (San Francisco [Calif.]) 1895-1913, 08 April 1900, Image 14, courtesy of chroniclingamerica.loc.gov. 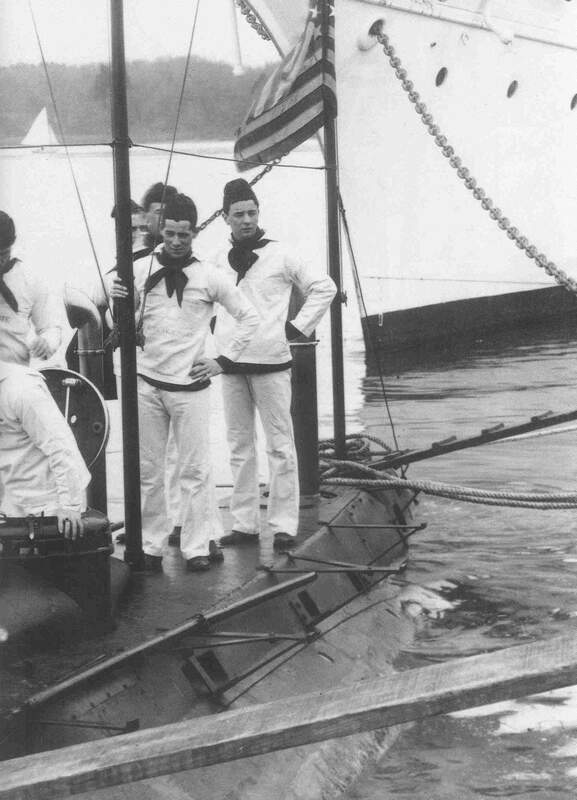 83k Holland's boat was modified for U.S. naval service in 1900, with planes and rudders moved abaft the propeller and the after pneumatic dynamite gun removed. This boat was never fitted with a periscope. 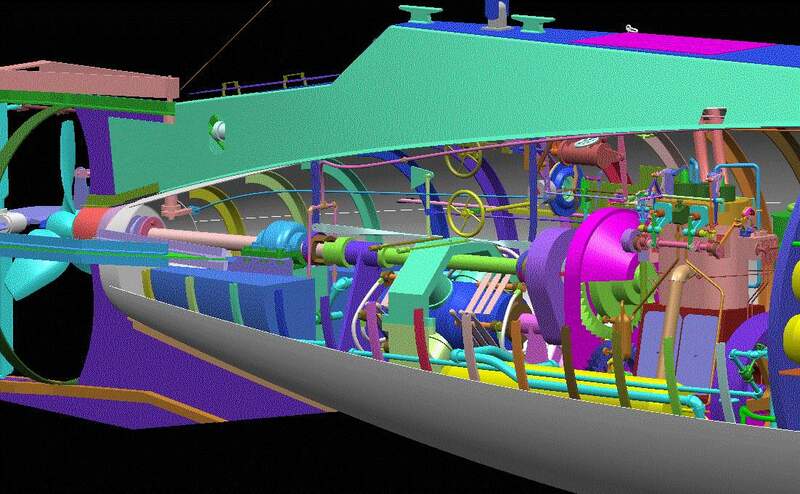 Note that the engine, whose shaft was low in the hull, had to be geared to the propeller shaft so that the latter could run along the axis of the hull. The main ballast tank was brought up the boat's sides outboard of the battery; it's top was U-shaped. 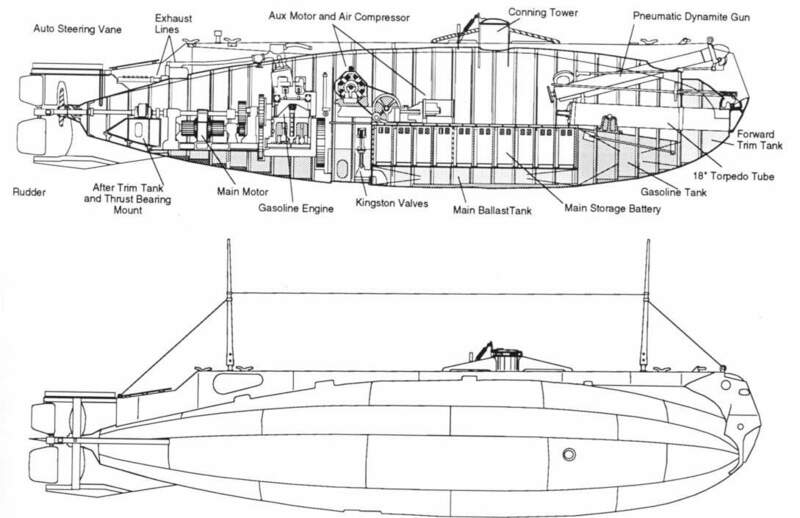 Holland patented this configuration, which he (and then Electric Boat)used in later designs. It made for relatively easy flooding and formed a bilge down the boat's centerline. The U-shape contributed structural strength. Largely because the U-shaped tank had been patented, Simon Lake had to use flat-topped tanks., which caused him serious problems. 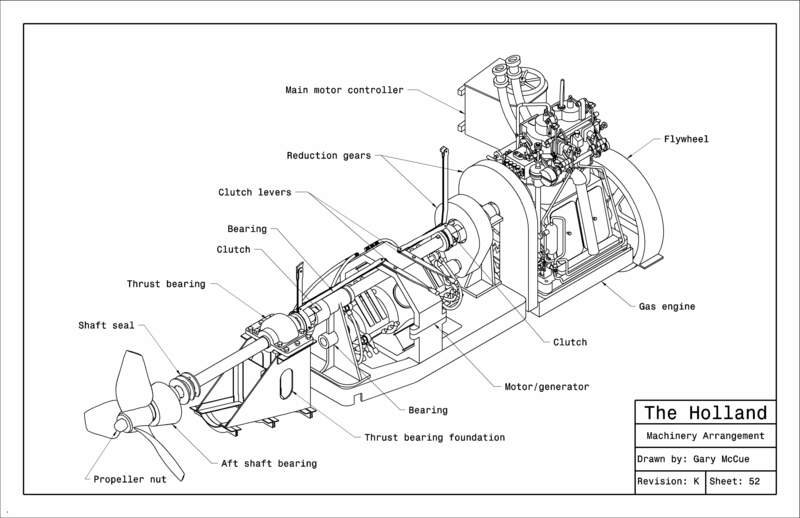 In this boat, the air compressor was driven by an auxiliary motor; in later Holland & Electric Boat designs, auxiliaries were geared to the propellers or shafts. Drawing by Jim Christley. Senior Shipbuilding Consultant for Dassault Systems. 2.04k RISE TO THE SURFACE. 2.72k EIGHT FEET BELOW THE SURFACE. 1.93k THE ENGINE ROOM OF THE HOLLAND (SS-01). 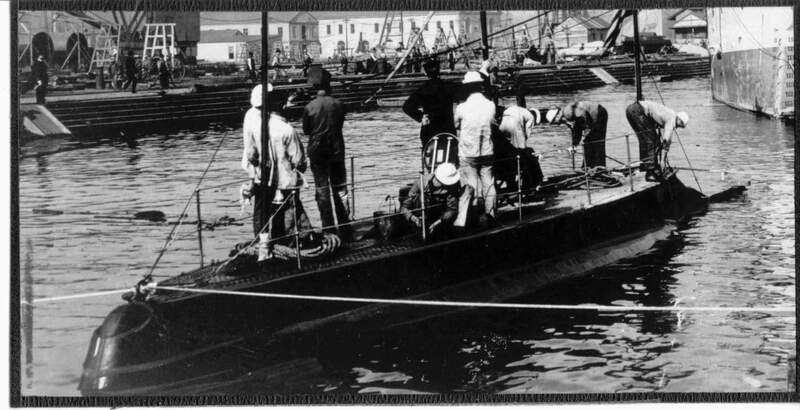 689k THE SUBMARINE HOLLAND (SS-01) IN WAR TRIM. 1.19k HOLLAND'S TORPEDO BOAT. Image and text provided by Library of Congress, Washington, DC. Photo & text by New-York Tribune. (New York [N.Y.] 1866-1924, 22 April 1900, Image 34, courtesy of chroniclingamerica.loc.gov. The Holland in Action, Destroying a Battleship by Means of a Torpedo Discharged Beneath the Surface of the Water. Image and text provided by State Historical Society of Missouri; Columbia, MO. Photo & text by The St. Louis Republic. (St. Louis, Mo.) 1888-1919, 29 April 1900, PART II, Image 16, courtesy of chroniclingamerica.loc.gov. 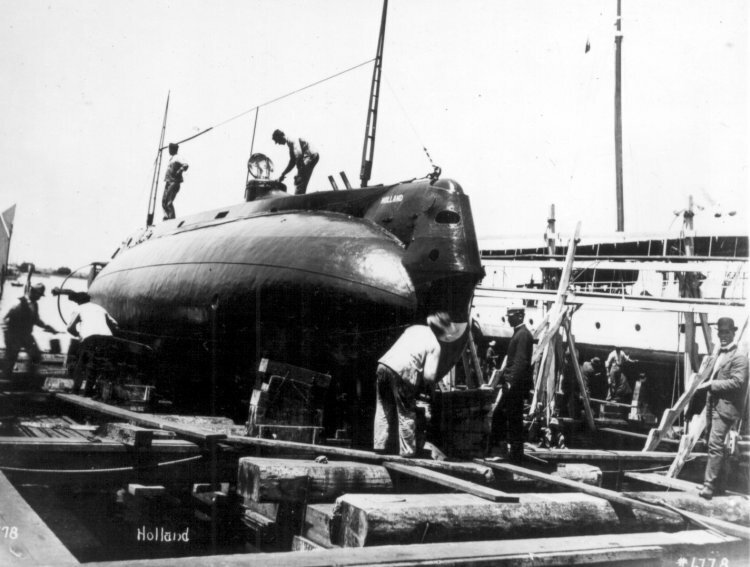 75k Holland (SS-01), in drydock, 1900. US National Archives photo # 19-N-6778, a US Navy Bureau of Ships photo now in the collections of the US National Archives. 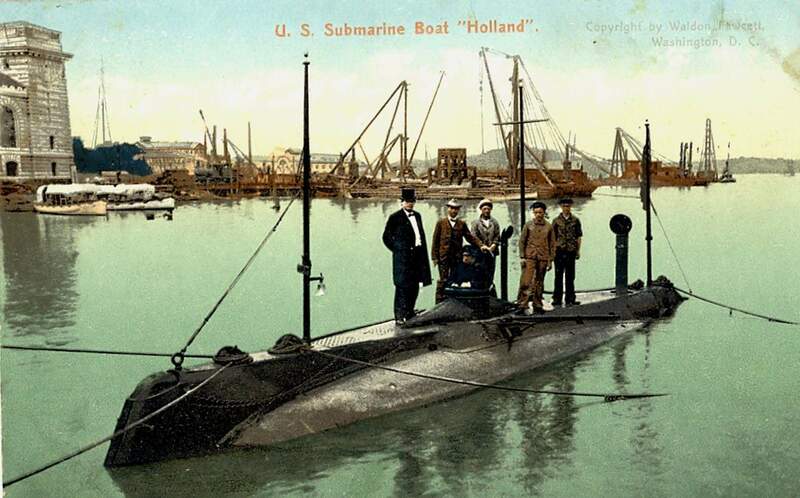 754k Holland (SS-01) circa 1900-01. Photo i.d. courtesy of Ric Hedmen. INTEREST TAKEN IN THE HOLLAND (SS-01) AT NEWPORT. NO Liquor ABOARD OF HER. The submarine torpedo boat Holland, lately transferred to the United States Navy by her builders, was the center of attraction to the Army and Navy officers who visited Newport last week to witness the naval maneuvers. Although the conditions were such that the Holland did not have an opportunity of showing her ability as an under water naval weapon, she did prove herself able to run a considerable distance to sea, to keep out of the way of swiftly moving torpedo boats and to get alongside a battleship without being seen, even though running only partially submerged. Image and text provided by Library of Congress, Washington, DC. Photo & text by New-York Tribune. (New York [N.Y.] 1866-1924, 30 September 1900, Image 34, via courtesy of chroniclingamerica.loc.gov. Sent to Naval Academy at Annapolis in Order-That Cadets May Be Schooled in Modern Warfare. LONGITUDINAL VIEW OF THE HOLLAND. A�MARKS PNEUMATIC DYNAMITE GUN TUBES. B�CONNING TOWER. O--SHIELD TOR GUN TUBES. D�DEVICE FOR CHANGING FROM GAS TO ELECTRICITY. E�PROPELLER. F-SECT1ON OF STEERING APPARATUS. G-GUNNER'S ROOM. Image and text provided by University of California, Riverside. Photo & text by The San Francisco Call. (San Francisco [Calif.] 1895-1913, 14 October 1900, Image 22, courtesy of chroniclingamerica.loc.gov. 30k Commander Harry H. Caldwell, USNR, born in St. Louis Missouri in 1873, became the first naval submarine commanding officer when he assumed command of Holland (SS-01) on 12 October 1900. Caldwell served in the Spanish-American War on board the cruiser Olympia as flag secretary to Admiral George Dewey at the battle of Manila Bay. Caldwell was Dewey's flag secretary at New York in March 1900, when the Holland was undergoing its final sea trials on the Potomac River. Caldwell was highly impressed by the new craft and requested to serve aboard her when she became a commissioned warship. Caldwell commanded Holland during it's pre commissioning trials off Newport, Rhode Island in August 1900. During the trials, Caldwell closed to within torpedo range of the battleship Kearsarge (BB-05), flagship of the U.S. Navy's North Atlantic Squadron, without being detected. Inset photo & text by The Evening World. (New York, N.Y.) 1887-1931, 20 October 1900, Evening Edition, Image 4, courtesy of chroniclingamerica.loc.gov. USN photo courtesy of the US Naval Historical Center. Text submitted by Bill Gonyo. 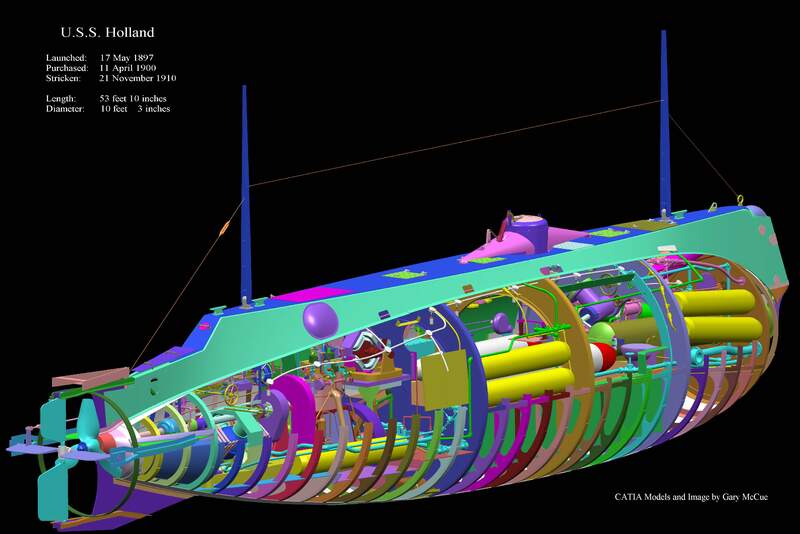 1.67k TO EUROPE IN A SUBMARINE BOAT Image and text provided by University of California, Riverside. Photo & text by The San Francisco Call. (San Francisco [Calif.] 1895-1913, 02 December 1900, Image 12, courtesy of chroniclingamerica.loc.gov. 716k THE HOLLAND SUBMARINE TORPEDO BOAT Image and text provided by University of Hawaii at Manoa; Honolulu, HI. Photo & text by The Pacific Commercial Advertiser. (Honolulu, Hawaiian Islands) 1885-1921, 21 December 1900, Image 9, courtesy of chroniclingamerica.loc.gov. Photo & text by Deseret Evening News. (Great Salt Lake City [Utah] 1867-1920, 26 January 1901, Part 2, Image 9, courtesy of chroniclingamerica.loc.gov. 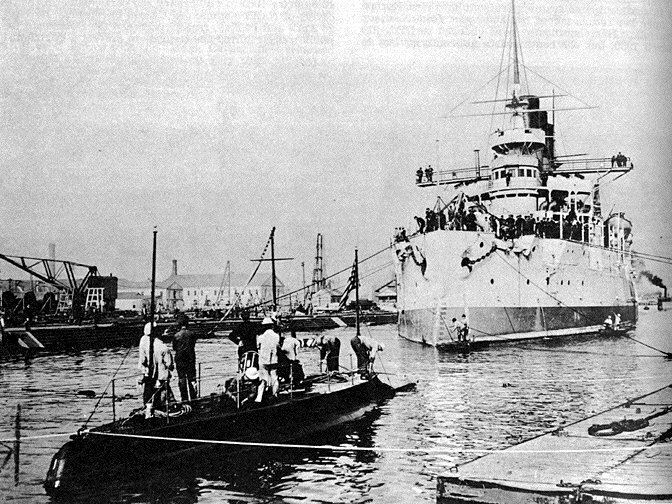 30k Holland (SS-01), in the foreground with the Russian battleship Retvizan entering the dry docks at the New York Navy Yard, 1901. USN photo courtesy of the US Naval Historical Center. 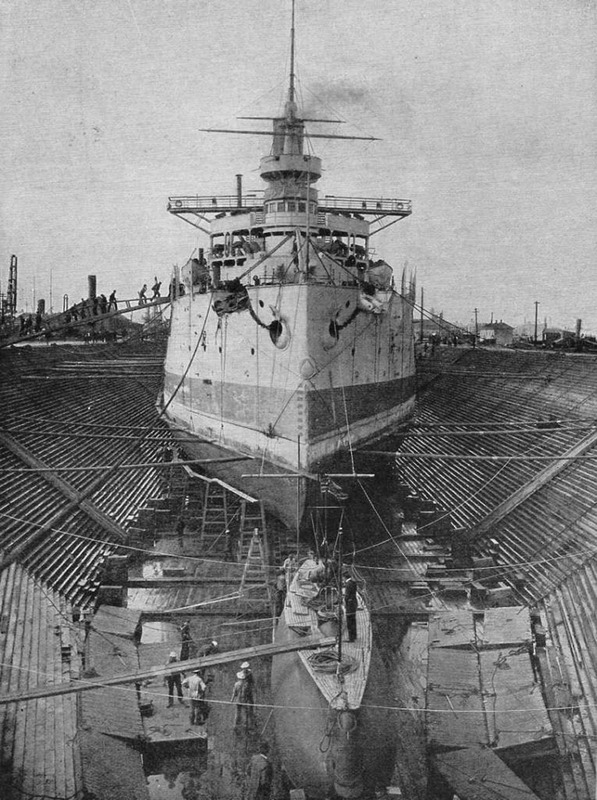 599k The Holland (SS-01) in drydock, circa 1901. USN photo courtesy of Scott Koen & ussnewyork.com. 201k Three paintings of the Holland (SS-01). USN photo courtesy of Scott Koen & ussnewyork.com. 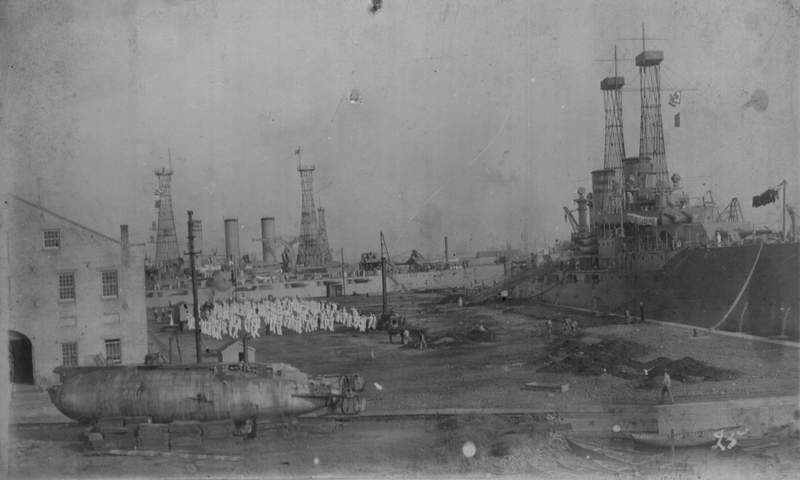 319k Holland (SS-01), in the foreground with the Russian battleship Retvizan in dry dock at the New York Navy Yard, 1901. 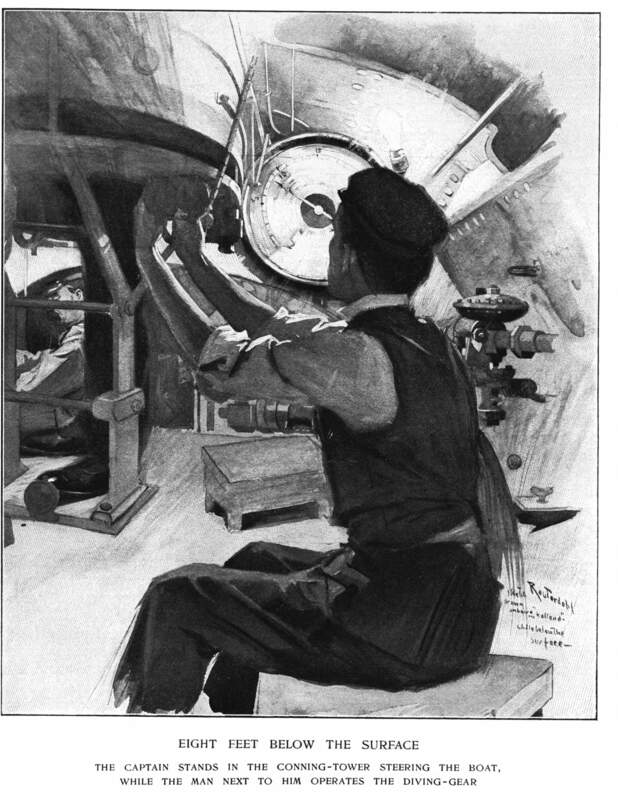 USN photo which originally appeared in the Ideal Home Educator, Libris bound edition published 1905, article titled �Will Battleships Be Obsolete�, written by Morgan Robertson. Photo courtesy of Jim Geldert. 1.47k INTERIOR OF A SUBMARINE TORPEDO BOAT OF THE HOLLAND (SS-01) TYPE. Frames and plates, looking aft. Image and text provided by Library of Congress, Washington, DC. Photo & text by New-York Tribune. (New York [N.Y.] 1866-1924, 14 April 1901, Image 33, courtesy of chroniclingamerica.loc.gov. Possible Result in Practice with Cruiser New York in Narrgansett Bay, 30 August 1900. Image and text provided by University of Kentucky, Lexington, KY.
Photo & text by Crittenden Press. (Marion, Ky.) 1879-1907, 02 May 1901, Image 3, courtesy of chroniclingamerica.loc.gov. Photo from New-York Tribune. (New York [N.Y.] 1866-1924, 05 May 1901, Image 30, courtesy of chroniclingamerica.loc.gov. 298k Holland (SS-01), at the US Naval Academy, Annapolis, MD., circa 1901-1902. 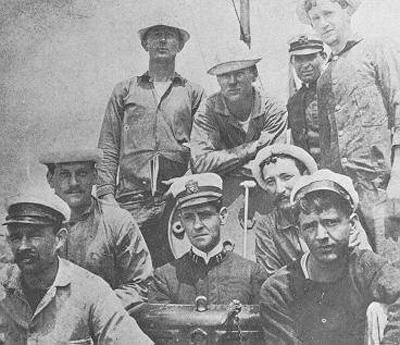 The crew on deck are, L to R: Harry Wahab, chief gunner's mate; Kane; Richard O. Williams, chief electrician; Chief Gunner Owen Hill, commanding; Igoe; Michael Malone; Barnett Bowie, Simpson, chief machinist mate, and Rhinelander. The two vessels on the right are monitors. The inboard vessel has only one turret and is probably one of 3 monitors: Arkansas (M-7), Nevada (M-8) or Florida (M-9). The outboard 2 turreted monitor is also one of 3 probables: Amphitrite (BM-2), Terror (M-4) or Miantonomah (BM-5). USN photo courtesy of the US Naval Historical Center. Photo from The San Francisco Call. (San Francisco [Calif.] 1895-1913, 13 April 1902, Image 14 via chroniclingamerica.loc.gov. 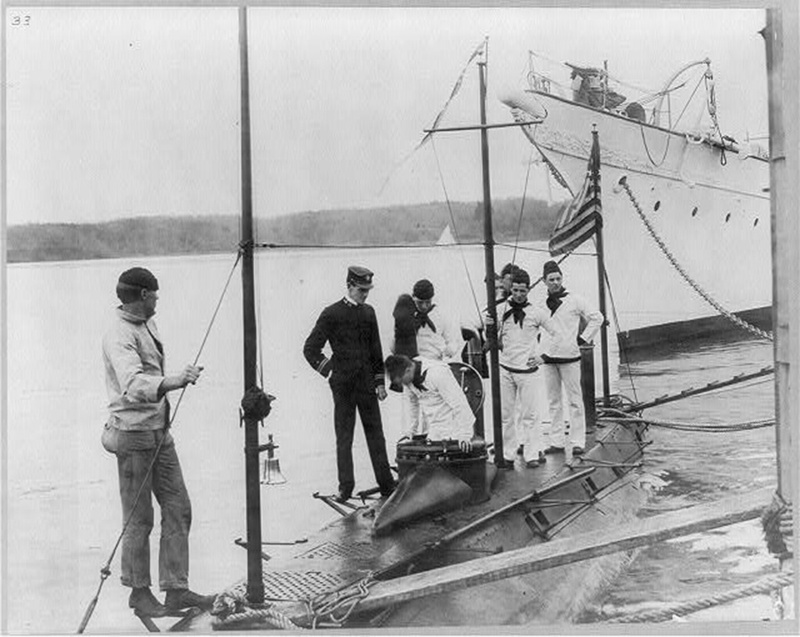 202k Midshipmen boarding the Holland (SS-01) at the U.S. Naval Academy, circa 1902. The Holland is serving as the Academy training submarine. High Res USN photo courtesy of Scott Koen & ussnewyork.com. Source: Library of Congress, Photo No. LC-USZ62-49405 courtesy of Mike Green. 1.19k WILL SUBMARINE BOATS PROVE IMPRACTICABLE ? All the navies of the world are deeply interested in submarine boats, but many experts fear that they will prove too dangerous to their own crews to permit their use in warfare. Investigation is now in progress, to determine this question and on its result depends the future of this new engine of destruction. Image and text provided by Minnesota Historical Society; Saint Paul, MN. Photo & text by The Saint Paul Globe. (St. Paul, Minn.) 1896-1905, 23 May 1902, Image 7, courtesy of chroniclingamerica.loc.gov. 261k 1902 colored postcard showing the Holland (SS-01), at US Naval Academy, Annapolis, MD. USN photo courtesy of Darryl L. Baker. Negative scanned courtesy of By Design, Benicia,CA. Colored postcard courtesy of Arnold Putnam. 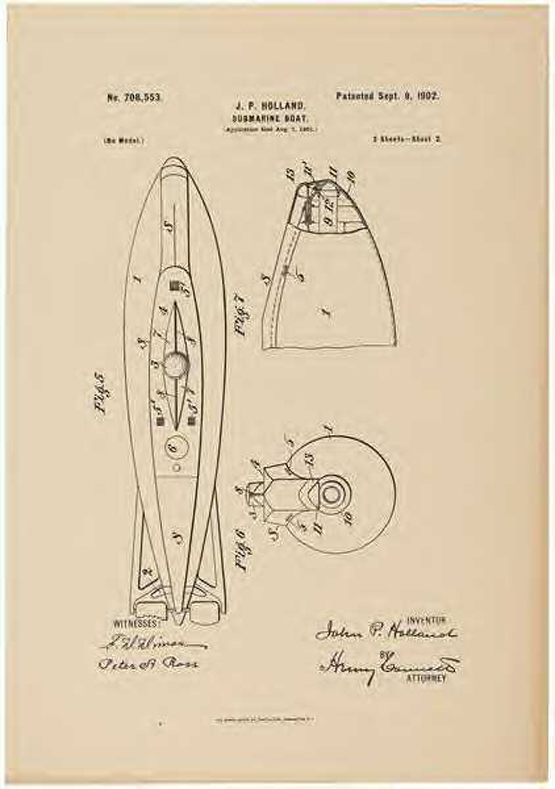 129k Drawing for a Submarine Boat, drawing for patent purpose, September 1902, bearing the names of the inventor, attorney & witnesses. Photo courtesy of NARA, Record Group 241: Records of the Patent and Trademark Office, 1836 - 1978. 755k Norfolk VA, Brown Avenue 26 October 1908. On the left is an Arkansas class monitor. Moving right there are several torpedo boats, then an A-class submarine, probably Moccasin (SS-5) along with the Holland (SS-01). Photo & text i.d. courtesy of Dave Johnston (USNR) from NARA. 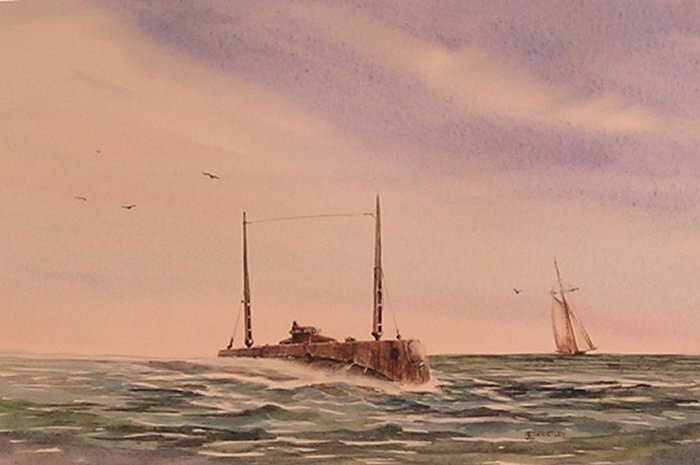 She was decommissioned and simultaneously struck from the Naval Register, 21 November 1910, at Norfolk, VA; Final Disposition, sold, 18 June, 1913, to Henry A. Hitner & Sons, Philadelphia, PA.
46k Watercolor by the artist Jim Christley entitled Holland 1903. Shown here on the surface in Peconic Bay, she was the first submarine to use the system of an air breathing engine and generator for surfaced propulsion and a battery, electric motor combination for submerged propulsion. This system is in use today in all but nuclear powered submarines. Photo & text courtesy of subart.net. 143k Holland (SS-01), date and place unknown. USN photo courtesy of Mike Green. She was the Holland (SS-01) first of modern underwater craft, and famous 15 years ago. Image provided by: Library of Congress, Washington, DC. via New-York Tribune. (New York [N.Y.] 1866-1924, 13 March 1915, courtesy of chroniclingamerica.loc.gov. The famous old American submarine Holland No. 9 was sent to the junk heap the other day, being utterly out of date and useless. It was bought by the United States in 1900 for $150,000. Image and text provided by University of Utah, Marriott Library. Photo & text by Iron County Record., (Cedar City, Utah) 1893-1982, 09 July 1915, Image 6, courtesy of chroniclingamerica.loc.gov. The Holland (SS-01), just before she was lifted out of the Delaware yesterday and sent to the scrap heap. Her short, bulbous shape is in curious contrast to the long, slender craft of today. She was accepted by the United States only 15 years ago. The original entrance to the vessel's interior was so small that a fat sailor would have had serious trouble pushing himself through. Image and text provided by Penn State University Libraries; University Park, PA.
Photo & text by Evening Public Ledger. (Philadelphia [Pa.] 1914-1942, 24 June 1915, Sports Extra, Image 14, courtesy of chroniclingamerica.loc.gov. 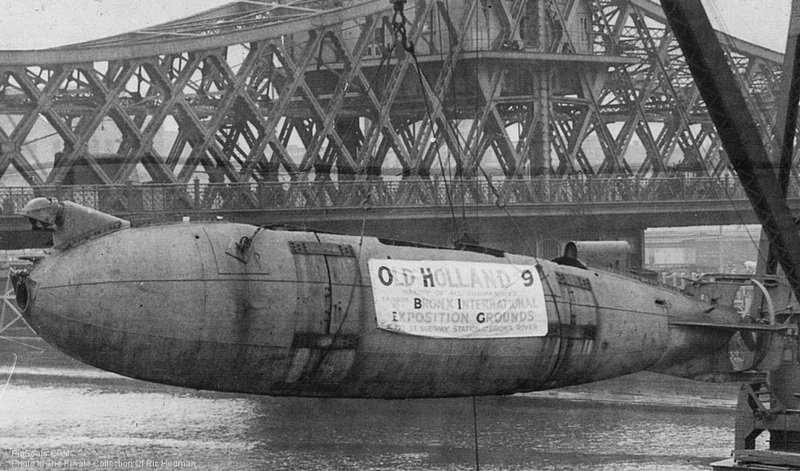 The first successful submarine, the Holland No. 9 lying at the pier with the superstructure removed. 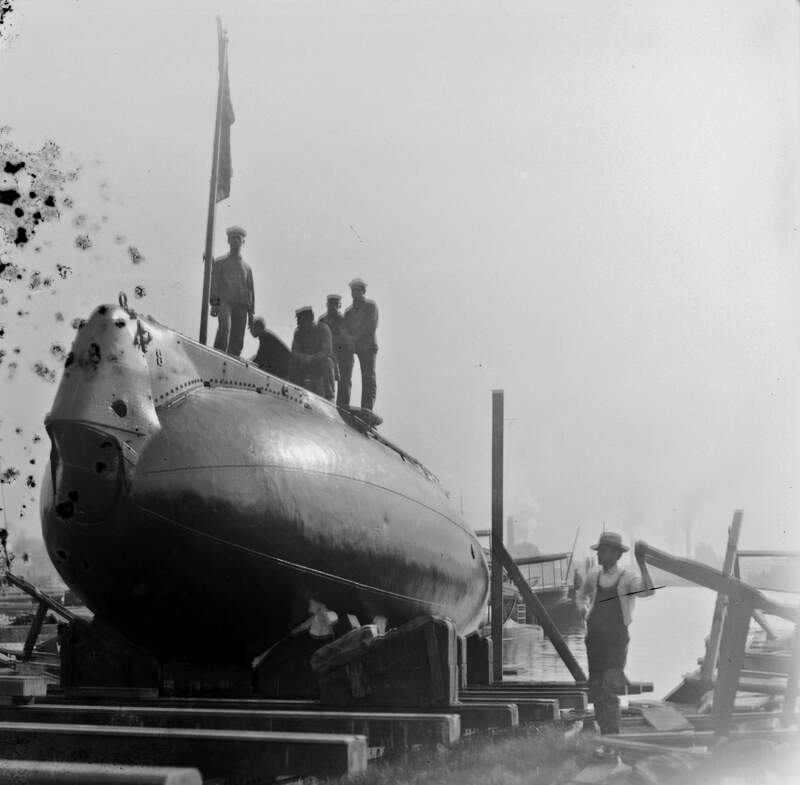 The projection at the top of the bow is the single torpedo tube which constituted the boat's sole mean of offense. Photo & text by El Paso Herald. (El Paso, Tex.) 1901-1931, 23 September 1916, HOME EDITION, Image 7, courtesy of chroniclingamerica.loc.gov. The Holland No. 9, the first submarine to be bought by the U.S. navy and thought to be invincible has been bought by Peter J. Gibbons and his son, who will present it to the New York Society. It was built by John P. Holland, submarine inventor. It will be placed on exhibition at the Bronx International Exhibition. Image and text provided by Arizona State Library, Archives and Public Records; Phoenix, AZ. Photo & text by Bisbee Daily Review. (Bisbee, Ariz.) 1901-1971, 21 October 1916, Image 1, courtesy of chroniclingamerica.loc.gov. Children of the McCall School paid a visit to the submarine Holland (SS-01), the first sub-sea craft in the United States Navy. The Holland is reposing, like a stranded amphibian, in the empty lots opposite Franklin Field before it goes to the Irish bazaar, in New York. Image and text provided by Penn State University Libraries; University Park, PA.
Photo & text by Evening Public Ledger. (Philadelphia [Pa.] 1914-1942, 17 October 1916, Night Extra, Image 18, courtesy of chroniclingamerica.loc.gov. 2.10k ONCE A SUBMARINE, NOW A CHILDREN'S PLAYGROUND. Image and text provided by State Historical Society of North Dakota. Photo & text by The Ward County Independent. (Minot, Ward County, N.D.) 1902-1965, 26 October 1916, Image 1, courtesy of chroniclingamerica.loc.gov. Photo & text by New-York Tribune. (New York [N.Y.] 1866-1924, 25 May 1917, Image 11, courtesy of chroniclingamerica.loc.gov. Insert photo courtesy of Ric Hedman.